The Junebug Weddings team has carefully searched the globe to find local and destination wedding photographers who set the trends, raise the bar, and deliver extraordinary customer service. We’re thrilled to recommend them for your wedding day! This is Junebug Weddings’ philosophy: a team of Wedding Planners and Wedding Photographers looking for the best professionals on the field to allow their clients to have the best services wherever they choose to get married. 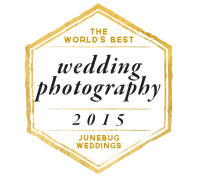 Junebug Weddings works with the florists, wedding photographers, film makers, wedding dress designers, djs and artists that are behind the scenes of the world’s most extraordinary weddings – the highest vendors for every couple! It was a pleasure for us to be called to take part to it. Moreover, in JunebugWeddings.com you can find everything you need for your wedding: ideas about the wedding dress, the style of the reception, the wedding colors, the professional to whom they could rely… Everything they need, from the first inspiration to the final wedding organization! All the photos can be filtered by colour, by theme or by location, in order to offer a great service! What are you waiting for? Check JunebugWeddings.com and get inspired… but don’t forget to take a look at our page!